Anonymous, unidentified bodies. At best, flows that must be “managed”; at worst, “human flesh”3. But never human beings whose rights are violated with impunity or the protagonists of their own life stories. This is the narrative inherent in policies applied to migrants, migratory routes and the borders of rich countries. According to UNHCR, the number of forcefully displaced people worldwide rose from 33.9 million in 1997 to 68.5 million in 20174. In 2018, the official number of deaths of migrants in transit was 4,4765. The three deadliest regions were: the Mediterranean Sea (49% of deaths), the African continent (30%, mainly Northern Africa) and the Americas (11%, of which the majority occurred in Mexico and its border with the United States) 6. These figures do not truly reflect, however, just how dire the situation that migrants face is. It is impossible to determine the number of migrants who have disappeared while travelling, either assassinated by organised crime or crime in uniform or due to border policies that are increasingly externalised to impoverished countries. The vulnerability of people who are forced to leave their homes to flee violence, war or the poverty caused by the grabbing and plundering of their territories by transnational corporations is one of the reasons for their invisibility. 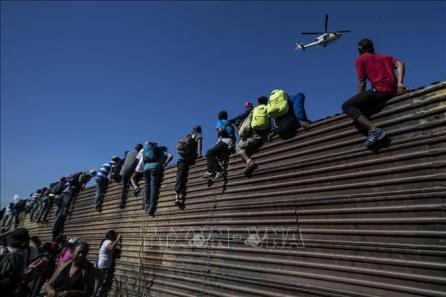 The caravans to the Mexico-US border organised by over 8,000 people, the majority from Central America, in late 2018 set a historical precedent. Appearing before press cameras from around the globe, they showed the world their capacity to organise collectively. They organised to exercise their freedom of movement and their right to safety7 – rights that the US, Mexican and Central American governments have denied them. Just as one of the caravans arrived in Mexico City in early November, the World Social Forum on Migrations 2018 got underway. The Forum brought together hundreds of activists, migrant organisations and solidarity from around the world8. In this article, we share some of the main elements raised during the “Globalisation of Border Control and the Peoples’ Resistance”9 workshop held at the Forum. The workshop was organised by the Transnational Migrant Platform - Europe, La Via Campesina, Stop the Wall, the Observatorio de los Derechos Humanos de los Pueblos, Coordinadora de Solidaridad con Palestina en México and Transnational Institute. The goal of the workshop was to develop a collective analysis of border control that looks at the power and impunity of transnational corporations, militarisation, the externalisation of borders, Israel’s role as a laboratory for the wall industry and the criminalisation of international solidarity, among other issues. It also generated a space for the convergence of struggles and for exchanges between initiatives focused on resistance and building alternatives. On the list of countries of emigration, Mexico ranks first in Latin America and second at the global level. Together with the US, it forms the largest migration corridor between countries. Also, as mentioned earlier, it is the third deadliest place in the world for migrants. During the workshop, Andrés Barreda (Unión de Científicos Comprometidos con la Sociedad, UNAM) provided key elements for understanding the situation in Mexico, particularly the causes of forced displacement and the impunity for the perpetrators of violence against migrants. Here, he referred to two crucial factors: the conversion of this country into an unparalleled industrial haven for capital from Organisation for Economic Co-operation and Development (OECD) countries and the structural diversion of power that is inherent in neoliberal policies, in general, and free trade in particular. According to Barreda, neoliberalism has generated not only tax havens, but also industrial havens in the past few decades, namely China. With an economically active population of over 700 million people10, this country is known for having the cheapest labour on the planet since the 1990s. Between 2003 and 2008, foreign direct investment (FDI) doubled11 and it became the seventh most important destination for FDI from the US, coming in behind only Western European countries12. Another element that attracted corporations was the lack of enforcement of even the most basic environmental regulations. However, since 2008, it has become increasingly complicated and dangerous for the Asian giant to deal with the large number of labour and environmental conflicts and the unprecedented levels of corruption. This led the government to implement radical political and economic changes, which were officially adopted at the 18th Congress of the Communist Party of China in 2012. In the five years that followed, the cost of Chinese labour in certain sectors reached the same levels as those in Portugal and large-scale recovery programmes for the domestic market and the environment were implemented. Furthermore, drastic measures were taken to tackle corruption, industrial chains owned by Chinese capital expanded and limits were imposed on the free exploitation and international exports of China’s main strategic natural resources, such as rare earth minerals. Essential for the latest technologies, 90% of the world’s rare earth mining reserves are located in China13. These measures led to the massive migration of US capital out of China and mainly into one of its previous prime destinations – Mexico – which had come to offer a particularly competitive environment since the mid-1990s thanks to the North American Free Trade Agreement (NAFTA)14. From a human rights perspective, the consequences of these changes had already been disastrous and the situation only got worse, as Mexico was consolidated as one of the key industrial havens in the world. On this, global specialist on genocide Daniel Feierstein15 pointed out that NAFTA launched a process of social destruction that was to dismember and destroy the identity of Mexican social fabric in order to impose a new model for extraction, production and consumption. This process involved the assassination of select social, environmental, peasant and indigenous leaders, journalists and human rights defenders, as well as feminicide and a civil war disguised as a so-called ‘war against drug trafficking’. It is estimated that between 1997 and 2018, at least 400,000 people died from violence committed by organised crime, with the complicity of the Mexican government16. According to Feierstein, a process of environmental degradation has been unleashed, which has caused extremely high levels of harm to health and numerous deaths and reached a point where the situation could be legally classified as genocide according to the United Nations Convention on the Prevention and Punishment of the Crime of Genocide. The case of the Atoyac River basin (in the states of Puebla and Tlaxcala) illustrates what it means to have an industrial haven in one’s region. In October 2018, the Fray Julián organisation alerted the Red contra el genocidio y la impunidad en México network17 to a case of environmental genocide in the Atoyac basin caused by the presence of at least 40 toxic substances in the water, soil and the air that over 3 million people breathe. It is estimated that 70% of the population in the river basin lives less than seven kilometres from industrial facilities that employ more than 100 workers18. In 2017, 20,400 industrial corporations (the automobile, steel, lumber, paper, chemical, petrochemical, agrochemical, food and beverage, ceramic, plastic and textile industries) were operating in the region. The majority of them did not treat their waste. Among these corporations, one finds transnational corporations from the US and Europe. Between 2002 and 2016, over 25,000 people died of cancer, of which 4,000 died from kidney failure. More than 900 cases of miscarriages were also reported. Currently in the region, on average, one person dies every four hours due to one of these causes19. The second element raised by Barreda to describe the current context in Mexico is the structural diversion of power that is inherent in the US model for politically subsuming consumption20 and the globalisation of this model during the most recent period of over-accumulation of capital and crisis. This is what configures the US model of economic subjugation known as neoliberalism. It is not a question of mere abuses of power, nor a structural policy of engaging in corruption or violating laws. It is much more than that: something that requires constitutional bodies to be completely restructured through legal reengineering and in order to do so, the legal system must be subordinated and the executive and legislative bodies must be reorganised through complex institutional engineering. In the US and Mexico in particular, one observes that state power has been largely diverted in a way that displaces the general interest of capital (which should be represented by the state in a capitalist system) for the benefit of a handful of powerful private capitalists. Economic power has thus also been diverted and this is perpetrated through the diversion of political, legislative, executive and judicial power. Within this context, one finds not only structural corruption, but also increasingly systematic ways of putting corporations’ economic interests before rights. As a result, the state becomes an impunity-producing machine with a growing capacity to prevent people from having access to justice. The diversion of state power serves to establish the core for the coordination of the extraordinary profits that generate the international capital flows of this group of offshore capital interests (in search of centres in the periphery that offer better conditions for labour exploiting labour and environmental deregulation) with the international flow of the labour force. This allows capital to displace the social fabric of the peoples like never before – whether they are in the places from which they are forced to leave, in transit or at their destination – which reduces the price of labour to exceptionally low levels. For Barreda, the diversion of power helps explain the promotion of land grabbing in zones that are to be occupied by capital, which are becoming increasingly rare, as well as the extraction of new strategic natural resources and the new ways of displacing and disciplining dispossessed peasants and workers using the new culture of terror currently being systematised by military and paramilitary groups and organised crime. These criminal groups use the media and seek to benefit the group of private investors that criminally monopolise control of the state. This involves the use of new ways of organising surveillance, transportation and detention, extortion, sexual abuse, kidnapping, degradation and the massacres carried out systematically by the migration and penal institutions along the migrants’ long transnational journey. At the same time, new ways of destroying the identity of trans-migrants, of attracting and disciplining migrants culturally and through police repression, and repelling workers in metropolitan centres of exploitation are also employed. Thanks to over-exploitation and the privileged group of capitalists’ extraordinary profits and control over the media and the police, they are able to attract waves of immigrants to the cities during cycles of economic growth. Then, during periods of economic slowdown and crisis, transnational capitalists expel them from the cities and even benefit from this, as they cynically promote xenophobia among the population and the privatisation of the penitentiary system and policing. This generates a “political added value” that appears at such times, as racism is propagated to turn people’s attention away from the social discontent generated by neoliberalism and support is given to all types of extreme right-wing and even neo-Nazi political parties. One of the tools for addressing the systematic violation of rights is the Permanent Peoples’ Tribunal (PPT). Its direct predecessor, the Russell Tribunal, established the foundations for the recognition of war crimes seventy years ago21. This opinion tribunal is based on the Universal Declaration of the Rights of Peoples (the “Algiers Charter” of 1976) 22, which broke with the atomist vision of society and the individualist conception of human beings found in several declarations produced since the 18th century. The Algiers Charter recognises the material conditions for existence, as well as the fact that humans are immersed in a wide range of social and community relations23. After many years and more than 40 sessions, the PPT has been consolidated as an effective means for collecting data and for analysing and establishing the bases for the law “from below” based on a dynamic aimed at empowering the people. There are clear connections between Barreda’s analysis and the results of the PPT Session entitled “Free Trade, Violence, Impunity and Peoples’ Rights in Mexico”, which were presented during the workshop by Verónica Villa (ETC Group). The PPT session judged the impacts of 20 years of free trade. Close to 2,000 social organisations presented and documented close to 500 cases of misuse of power. The PPT ruled that NAFTA had caused the compulsory elimination of the rural and urban population, through economic means, as it led to interventions that provoked distortions in subsistence economies. Furthermore, the cases directly linked free trade to migration during the session. They brought to light multiple rights violations, homicides (including for the purpose of organ trafficking), kidnapping, extortion, all kinds of sexual abuse and torture. The verdict confirmed the responsibility of the states of origin, transit and destination of migration and transnational corporations. In sum, the PPT Mexico Session gave greater visibility to a systematic policy of extermination along the migratory routes, which is in effect even today24. Furthermore, the PPT process strengthened one of the most important networks of communities, indigenous, peasant, trade union and social organisations on the continent: Asamblea Nacional de Afectado/as Ambientales (the National Assembly of Environmentally Affected People)25. During the workshop, a dialogue was also established between the Mexican experience and the one within European borders, which had been the subject of the PPT session entitled “Violations with Impunity of the Human Rights of Migrant and Refugee Peoples”26, presented by Braulio Alfonso Moro (France Amérique Latine). Since 2017, in response to the call of dozens of migrant, trade union and social networks and organisations, the PPT has held sessions in Barcelona, Paris, Palermo and London. The PPT has revealed how European borders constitute “non-law” legal and political spaces that are separate from the laws on the rest of the territory. It also recognised that “border wars” are currently underway, which criminalise people in transit, treat them as mere objects and strip them of their human condition. The PPT also identified necropolitics as one of the capitalist economic system’s chosen means that, when implemented by states and corporations, “not only exploits and expels, but also lets people die”. During the Barcelona Hearing (June 2018), the jury affirmed that crimes against humanity were being committed at European borders and held the European Union and its member states responsible for them27. One key actor denounced in the PPT Sessions in Mexico and Europe was transnational corporations. During the workshop, Nick Buxton (Transnational Institute) presented a series of studies that demonstrate how the transnational corporations that have influenced and benefitted from border security contracts are also some of the biggest arms dealers in the Middle East and North Africa. They fuel the conflicts that have caused the dramatic increase in the flow of refugees. In addition to the security market, which is worth 15 billion euros today, between 2005 and 2014, EU member states granted licenses to export arms to the Middle East and North Africa for a total of over 82 billion euros. The big players that are both part of the European border security complex and sell arms include: Hensoldt, Airbus and Rheinmetall and Leonardo and Intermarine. Other biometric security corporate suppliers that have been benefited by the growth in border security spending are: Veridos, OT Morpho and Gemalto28. Buxton also denounced how the EU externalises its borders by pressuring other countries (48% of which have authoritarian governments) to accept deportees, donations of monitoring and surveillance equipment and its offers to train police and border guards and develop biometric systems. Another central element in migratory policies is the construction of walls. Close to 1,000 km of walls (the equivalent of more than six Berlin Walls) have been built in Europe since the 1990s29. During the workshop, Maren Mantovani and Jamal Juma (Stop The Wall) revealed how Israel serves as a country-laboratory for the war, repression and security business. Between 2004 and 2017, Israel occupied first place on the Global Militarisation Index developed by the Bonn International Center for Conversion30. It also comes in eighth in the list of the biggest arms dealer in the world, moving up to number one when population size is taken into account31. According to the Boycott, Divestment and Sanctions international movement, the country is home to a large number of military corporations that are “key players in the maintenance of the infrastructure of Israel’s regime of oppression against the Palestinian people” 32. Israel’s technology is openly advertised as “field tested”, which is in reference to its testing on Palestinians33. Among the Israeli arms corporations, one can mention, for example: Elbit Systems, which supplies and provides maintenance for surveillance systems for the wall and Israeli colonies and produces the drones used in recent attacks on Gaza and white phosphorous ammunition for mortars; Israel Aerospace Industry (IAI), which provides surveillance technology for the wall and combat planes, such as Heron TP, the unmanned aircraft used in Gaza; Israeli Military Industries (IMI), acquired by Elbit, which supplies combat weapons and cluster munitions; and Rafael, arms exporter and the manufacturer of Spike missiles. Resistance to the wall industry is building, as increasingly broad and strong ties are developed between Palestinians and other peoples34. Here, it is worth highlighting the “World without Walls” global mobilisation35 and the campaign for a military embargo on Israel. According to Mantovani, the goal is not only to show solidarity with Palestinian people, but also to undermine the economic system itself, which has devastating impacts on migrants. During the workshop, the importance of women in resistance to the militarisation of borders and the establishment of solidarity networks was clearly illustrated. Ana Enamorado, from the Mesoamerican Migrant Movement, shared the experience of the 14th Caravan of Central American Mothers who travelled part of the migration route in search of their disappeared children36.The caravan joined the “Global Summit of Mothers of Missing Migrants”, in which relatives of migrants from Mexico, Guatemala, El Salvador, Nicaragua, Honduras, Spain, Italy, Algeria, Tunisia, Senegal, Morocco, Mauritania and the United States participated. For the mothers, people have the right to migrate or not; both are rights. They held the states responsible for the creation of “geographies of terror” and they mobilise to demand not only truth and justice, but also a life with dignity in all countries37. Rosemary Rojas Martínez, member of the Yaqui and Apache peoples and representative of La Via Campesina’s (LVC) Women’s Committee in North America, reported on the actions taken to support migrant women working as day-labourers on farms on the US side of its border with Mexico. In addition to intense labour exploitation by agribusiness and health problems caused by exposure to agrochemicals, she denounced violence against women’s bodies, as women are treated as sexual objects and the spoils of capitalism’s war. She also reported how the Trump administration is planning to build facilities to detain 20,000 unaccompanied migrant minors and 12,000 families on the Goodfellow and Fort Bliss military bases (in El Paso, Texas). Different sources (including the US army itself) have reported the presence of radioactivity and Agent Orange at Ford Bliss and carcinogens in the water at Goodfellow38. Daughter of an army officer, Rojas Martínez talked about her childhood at Fort Bliss and how her relatives gradually became ill from the contamination. One of the struggles of the LVC Women’s Committee is specifically focused on stopping concentration camps for migrants from being built on both military bases. The workshop offered another opportunity for an exchange of views with Europe on this issue. Deborah Valencia, from MELISSA, a member of the Transnational Migrant Platform-Europe, explained how a network of migrant women was created to support refugee women when they arrive on the Greek coast39. Together with the Philippine organisation Kasapi Hellas, they offer a programme for unaccompanied minors. The type of support they provide is not limited to responding to basic needs; they seek, above all, to empower and strengthen communities to address the extreme vulnerability of the women who have recently arrived and their families. Close to 150 women from Syria, Somalia, Afghanistan, Iran, Iraq and other countries staying in refugee camps meet daily to exchange experiences, obtain training in various areas and develop their own tools. The World Social Forum on Migrations in Mexico was held shortly before the United Nations Intergovernmental Conference (Marrakech, December 2018) in which “The Global Compact for Safe, Orderly and Regular Migration (GCM)” was approved. During the workshop, Carlos Marentes, from La Via Campesina, presented a critical analysis of the Global Compact for Migration elaborated by social organisations. He highlighted that the agreement gave priority to elements such as security and the economy and was limited to regulating the flow of cheap labour. Also, during the Forum, a declaration affirming that the GCM was a tool to allow rich countries, transnational corporations and capital to control the entry of people for their own benefit was presented. The declaration also stated that the Global Compact legitimised the detention and criminalisation of migrants and promoted the exchange of biometric data, which constitute important setbacks in terms of rights. Another problem is that the UN agreement is not binding and it will marginalise important instruments such as the “International Convention on the Protection of the Rights of All Migrant Workers and Members of Their Families”. Marentes also stated that migration is a right and an act of resistance against the capitalist system, which condemns peasants, indigenous people, women, men and children to disappearance. He argued that if anyone is key in terms of social change at the global level, it is migrants. It is difficult to reproduce the wealth and diversity of the exchanges that took place during the workshop. For example, participants shared experiences such as Radio Huayacocotla40, which links the voices of indigenous migrants living in the United States to their families in Veracruz and, as Alfredo Zepeda explained, monitors respect for labour rights on both sides of the border. Another example was the ties that the Observatorio de los Derechos Humanos de los Pueblos works to develop between struggles, as mentioned by Daniela González. These are but a few examples of daily resistance to necropolitics at borders and they serve as incubators for inspiring alternatives. From the conclusions, journalist Laura Carlsen highlighted three urgent actions. First, there is a need to establish, from below, an accurate diagnosis that allows us to analyse the reality of migration in depth in a context where policy is generally chaotic and where different groups of capital interests clash. This analysis should integrate migrants as subjects of their own lives and agents of change and, at the same time, objects that are exploited and repressed to serve the interests of capital and transnational corporations. Secondly, she observed that the problem lies in the concentration of wealth and plundering and that it is fundamental to build a new narrative that enables public opinion to understand what is truly happening and that serves as a firewall against the various forms of neofascism that promote a culture of fear. Finally, Carlsen emphasised that we must concentrate on strengthening grassroots organisations and international networks and alliances. 1 A shorter version of this article was published in FAL MAG, no. 139, December 2018 (https://www.franceameriquelatine.org/falmag/). Thanks to Karen Lang for the English translation. 2 While the sole responsibility for the content lies with the author, we thank the following people for their input: Andrés Barreda, Maren Mantovani, Carlos Marentes, Niamh Ni Bhriain, Rosemary Rojas Martínez and Brid Brennan. 5 According to the UN, since 2000, more than 60,000 have lost their lives in transit (https://youtu.be/XzTypC1jblI). 14 According to UNCTAD, between 2008 and 2012, the flow of US FDI to Mexico tripled, while FDI to China was reduced to a fourth of the original mount. At the same time, stocks in Mexico increased 16% and fell 5% in the Asian country (https://unctad.org/en/Pages/DIAE/FDI%20Statistics/FDI-Statistics-Bilateral.aspx). However, China continued to be a FDI host country in subsequent years, coming in first place at the international level in 2014 (https://unctad.org/en/PublicationsLibrary/wir2015_en.pdf) and in second place in 2017, behind the United States (https://unctad.org/en/PublicationsLibrary/wir2018_overview_en.pdf). 15 Interview with Daniel Feierstein in “A Contracorriente”, March 12, (see: https://www.rompeviento.tv/?p=43291). 16 Denuncia de la Red contra el Genocidio y la Impunidad en México (see: https://www.youtube.com/watch?v=9MCXwHEy0hc&index=4&list=PLwzDqMdprgdsK8Q77AOziaHm1FhwzrJ3Z). 23 Barreda, A. and Espinoza R. “La destrucción de México ante el Tribunal Permanente de los Pueblos”, in: Revista El Cotidiano, Nº 172, 2012, p. 174. Although the Universal Declaration of Human Rights of 1948 represents an important change, as it incorporated into international law the principles of peace, human rights and the peoples’ right to self-determination, there is no effective international jurisdiction capable of enforcing the Declaration. This is why the Lelio Basso International Foundation and the International League for the Rights and Liberation of Peoples promoted the elaboration of the “Algiers Charter”: they shared the conviction that the respect for human rights implies respect for the rights of peoples. The Charter codified the right to: national and cultural identity, political and economic self-determination, culture, environment, common resources; the rights of minorities and guarantees for these rights (http://permanentpeoplestribunal.org/wp-content/uploads/2015/01/Carta-di-algeri-EN-1.pdf). 24 See the ruling from the Permanent Peoples’ Tribunal Session in Mexico (http://permanentpeoplestribunal.org/wp-content/uploads/2012/07/SENTENCIAFINAL_MEXICOingles.doc.pdf). 34 For more information, see María Landi, “Articular las luchas por un Mundo sin Muros” (https://mariaenpalestina.wordpress.com/2018/11/26/articular-las-luchas-por-un-mundo-sin-muros/). 39 It is worth highlighting that MELISSA was one of the organisations that requested the Permanent Peoples’ Tribunal’s Session on “Violations with Impunity of the Human Rights of Migrant and Refugee Peoples” and presented a case under the Women’s thematic axis during the Barcelona Hearing (June 2018).